Like the sound of it? Then read on for an extract and all the buying links you need. Four characters started off my novel – I saw their journey and I knew how they would interact. There was Alisha, Richard, Michael and Michael’s wife, Jessie. These people jumped into my head one night and refused to go away – they had a story and it was clear that I wasn’t going to get any peace until I recorded it! I found an old notepad and I started to write, I have a confession here because I kept my hectic scribbling secret from my husband – we don’t have secrets but I wanted to build the beginnings of my book without interruption– I didn’t want advice or anything to stop the flow of my initial thoughts – but slowly it dawned on me, just how long this was going to take! Extra characters were required and I decided I needed a spreadsheet – my novel would run over decades – there would be children, birthdays and significant anniversaries of different happenings – I needed a computer. If I wanted to complete this compelling novel, I needed two things; time and Paul’s support. My husband’s reaction to my casual statement over breakfast that I suddenly had to write was wholly positive, the amazing man said I had to do it – I mustn’t let something like this fade away – ‘Don’t live on regrets’. I explained that I would need a month to get the book finished and despite us living on the money we earn each month, he said ‘Do it, Celia.’ He would work extra hours to make up my lost income. So that’s what I did. It hasn’t taken a month though! 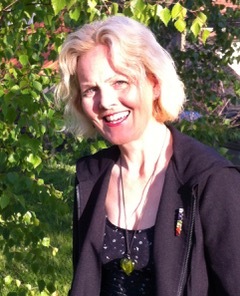 I treated my new adventure as a job – I started at 8.30am and wrote until Paul got home, I made dinner and then I got back to typing – most days I crept into bed about 2 or 3 in the morning. The story took over my life. I was obsessed. The spreadsheet was invaluable, as new characters crept in, I added a new column with their names. The other index was the year – I could track their ages and events and I had an easy-to-manage timeline. Character’s names changed as the book developed because my original ones weren’t working for me. Central Alisha metamorphosed into Billy early on – it seemed right for her as she grew more real. Billy is eighteen-years-old at the start and she had to slowly acquire new attitudes – not always the wisest ones, to deal with the events and people she experiences. She is naive with the world at her feet but the initial events in the story leave her fearful and unable to trust. The plot changed too. As characters developed the things that happened to them needed to change to. I had to create scenarios which exposed their changing perspectives. One of my favourite characters Daniella, Billy’s mother evolved. At times, it felt like the characters were actually living these lives– I was simply writing what I saw. At other times, I was Billy with all her demons. I lived through all my characters’ back stories even though I wasn’t going to include them all in the book. Instead I would use carefully chosen morsels to convey their past experiences. I understood their motives and reactions and I cried their tears. I had to lose a couple of my minor characters and it was desperately hard to let them go. They were precious friends and I nearly corrupted the future plot so I could hang onto them. Their particular stories were so interesting to me that I considered giving them main roles instead of the intersections they were intended to be. My characters nearly took control! I mapped out each individual’s core values so I knew how their morals would cause them to behave and the novel saw these challenged, changed and sometimes restored – just as I see happen in life. I wanted to let some characters give an outward projection of themselves that wasn’t true – again, just like the real world when you discover people aren’t as nice as you thought! Every character reacted differently to situations some became stronger and learnt from mistakes – others crumbled. 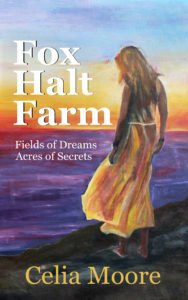 Fox Halt Farm became so real because my characters felt like they really lived this story. Some fell apart, some were played and some triumphed. A true adventure for the characters and me! It all sounds fascinating, Celia. Thank you so much. And that spreadsheet sounds invaluable! I love the colours in the cover. I used to live near Dartmoor and remember it’s wonderful, natural terrain. The moors could be quite atmospheric and I think this cover depicts that. thank you Adele, there are wonderful colours here today with the frost emphasising them. The cover is actually not Dartmoor it’s another scene in the book but I wanted it to still be able to give a feel of the tors and the open moorland, the sunsets and sunrises are stunning on the moor. How lovely of you to say so, Celia. Thank you for being a guest on my blog.